The sweet potato (Ipomoea batatas) is a dicotyledonous plant which belongs to the family Convolvulaceae. Amongst the approximately 50 genera and more than 1000 species of this family, only I. batatas is a crop plant whose large, starchy, sweet tasting tuberous roots are an important root vegetable (Purseglove, 1991; Woolfe, 1992). Large Starchy, Sweet Tasting Root Vegetable. Leafs can be eaten as Greens.. 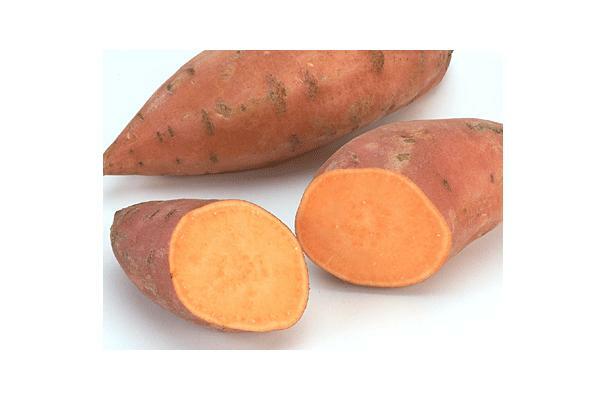 Choosing: When choosing sweet potatoes look for the largest of the bunch! Make sure that they are fresh and are without bruising of any kind. Buying: You can purchase at your local grocery store or local farmers market. Procuring: Best grown at average temperature 75 Degrees F. Pesticides are rarely needed. You can boil, roast, bake or fry sweet potatoes. Great substitute for fries. Cleaning: You can rinse the sweet potatoes in cool water in preparation for cooking.